If you use a strap with grommets every inch, and, let it out one inch at a time at each end, you could work out the fabric width you need at the head and at the feet. Have a hook for the grommets at the end of each pole, suspend the poles separately from the hammock, until you get it right. Let's see..he probably weighs 150 soaking wet and shaped like a beanpole... ..How do you compare with that? You have to understand that some hammocks are made for the person to lie across the bottom more 45 degrees to the tie outs..not in line with them. A bridge hammock forces you to lie down the center between the supports creating the V under your body as it does for that person.Put a 200lb person in that hammock and it'll form a sharper V around his body.If you lie flat on your back,the pressure pushes in on the widest point of your body..your shoulders..and around your back. Lying NOT in line with the tieouts,and lying on your side creates the "pull" pressure more at your chest and center of your back..verses the knees and feet(if your legs are slightly bent).It allows the material to stretch out more where it is needed.That's generally how I sleep in my hammocks. If you notice that guy is lying on his side with his knees creating a wider point there between his knees and feet.He is also widening the front with a scrunched- up pillow filling the V there and his shoulder is filling the actual V.The pillow keep the material off his face.There is no "flat" other than what he has created with the way he is laying in the hammock. If I lie on my back in my hammocks,the pressure is more off my right shoulder and against my left knee due to the side tie outs at those locations. I'm 5-7 and 180lbs with broad shoulders/ chest(construction,surfing,etc for my size..but my belly is catching up..about 10lbs over my ideal weight right now).Weight and body shape make a difference. Try sewing on some side tieouts on the outside at the shoulder points(say 24-30" apart) and stake it out there(maybe some bungie cord type tieouts).It should stop the bridge hammock sway and give you more room for your shoulders and flatter lay across that point that counts.Try some "clamps" at those tie-out points and adjust those tieouts until they feel right for you..THEN sew them on.Another option for a "flat lay"..is to remove the top end of a coleman cot and suspend that from four points instead of two..otherwise it'll roll you out of bed before morning. I think I linked a video earlier to something like this. It was a hatch cover but I imagined it being used upside down as a flat hammock possibility. It was designed to catch and funnel air into the lower cabin but it's construction looked perfect as a hybrid bridge hammock to me. My dad was big and tall. It supported him for laying flat in the hammock. His hammock was more narrow and had a shorted spreader bar at the feet and had a longer spreader bar at the head. I would say, compare it to a backyard hammock. Work out the spreader bar length, as well as, the width of the cloth at the feet and at the head. Remember, you can tie the head of the hammock higher than the feet. I was lucky today and found the site where I got those 2 photos from. Here is the story that goes with the photos. copied without permission and will be deleted next week. A hammock you can sleep in with a straight spine! Do you like the idea of a hammock for the stable ride it gives on a rolling ship, but don't like sleeping bent in a curve? This design of hammock is based on the principle of a suspension bridge - the suspension wires (hammock ropes) are curved, supporting a straight roadway (the part where you sleep). If the hammock is tensioned correctly, it allows you to sleep on your back, side or front, with a straight spine. Hardly traditional, but very comfortable. I chose the length below simply because 1900 mm was the width of the cloth I could buy, and it was long enough for me. To make a longer hammock, I suggest drawing out this curve full size, then extending the curve to the extra length in both directions. Use a bendy piece of wood to draw smooth curves. You will need extra width in proportion – I would not make the middle any narrower than this. I used an unproofed cotton canvas, for greater comfort on hot nights. A synthetic cloth would be stronger and more mildew resistant. Cut your piece of cloth to the size below (or bigger). Note that this is not the finished size, as all edges must be hemmed. Note also that there is more curve in the side at the head end, A, to support the greater weight of the upper body. Cut the triangular corner reinforcing pieces from the side offcuts and sew them on (I used a domestic sewing machine for all except the edge roping, with no problems). Make up the rope bridle as shown below (I used 12 mm Silva rope), hand sewn along the curved edges with doubled sewing twine, using a needle and palm, in the same way as a bolt rope is sewn onto a sail. This is quite fast to do. Sew the rope especially strongly to the corners. Add an outside pocket or two for your torch, water bottle etc. Fit two 750 mm wooden spreaders (longer in proportion if you have increased the size), rig the hammock and adjust the tension until your spine is quite straight (if you sag in the middle, increase the tension; if you droop at the ends, decrease). It looks odd when empty, but is great when you are in it. Enjoy! 1. Put a net or similar across the head end so your pillow can't fall out. 2. Put a bit less curve in the sides if you like a tight, high hammock, or more curve if you prefer a soft, low hammock. Cant cut sides..you've got material and a sewing machine..give it a try and let us know how it works out ...Sounds good in theory...32" wide in the center?? Length seem short also..if those are "dimensions" in the bottom shot. Dan..on you it may fit like a thong.. EDIT:Okay..I read the article and why he chose those dimensions..cloth size limitations.. to avoid adding/sewing more pieces... ..sailor and boats..space limitations probably..
On another note..might make a good emergency shelter over head with trek poles at the wide end in a V..dual purpose..carry along a ground sheet. I've got a bridge hammock that was cut to my dimensions by Dutch from Hammockforums. It lays FLAT. So flat in fact I can sleep on my stomach in it which is how I prefer. It is VERY comfy. I can even use my hiking poles as the spreader bars if I want. I tried sleeping on my stomach while in my Grizz Bridge hammock. Can't do it. I need my hands under my face kinda. elbows out streatched left and right. I'll make a hammock with pockets on the inside so my elbows will extend into the pockets while on my stomach. While I'm at it I'll add 2 of the same kind of pockets for my knees. Let's call the pockeds "slits"
JBRanger has it nice. He's found the ultimate hammock for him. Dutch must be quite the hammock designer/manufacturer. Kudos to dutch. In my tent I use an aluminum framed cot with synthetic fabric stretched on it. I have to use a self inflating matress to fill the sag in the center(think hammock sling) I do that so I can sleep on my stomach with one knee over the side rail and the same with one elbow outstretched for comfort. For the last 2 days I've been in a thinking on how to design the ultimate flat hamock for me. The hand and knee holes are a good start for me. I think it will take precedence over my wants for a teepee. I need a base camp hammock. I want to swing in the breeze on hot summer nights, serious!!! Ok, the site I linked to is a nautical type site. Boats lazily rolling on the waves. Sailors in their spare time had one thing in mind(not shore leave!!! ) a good nights rest on a comfy hammock. They desined one after another until they came up with the bridge type. One improvement over the other. You can see the stiching required to secure the fabric to the rope. A fabric with the least amount of stretch and the rope also....no stretch. edited to add photo. Look at the center hammock. what do you see??? The deeper the cat cuts along the side the flatter the lay, just FYI. 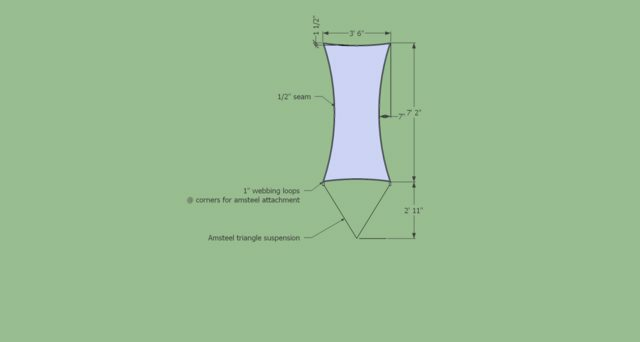 Here are the dimensions from my hammock. Note: Only one end suspension is shown.